In May of 2014, our darling third child was born. In June of 2014, we drove 14 hours to Disney. 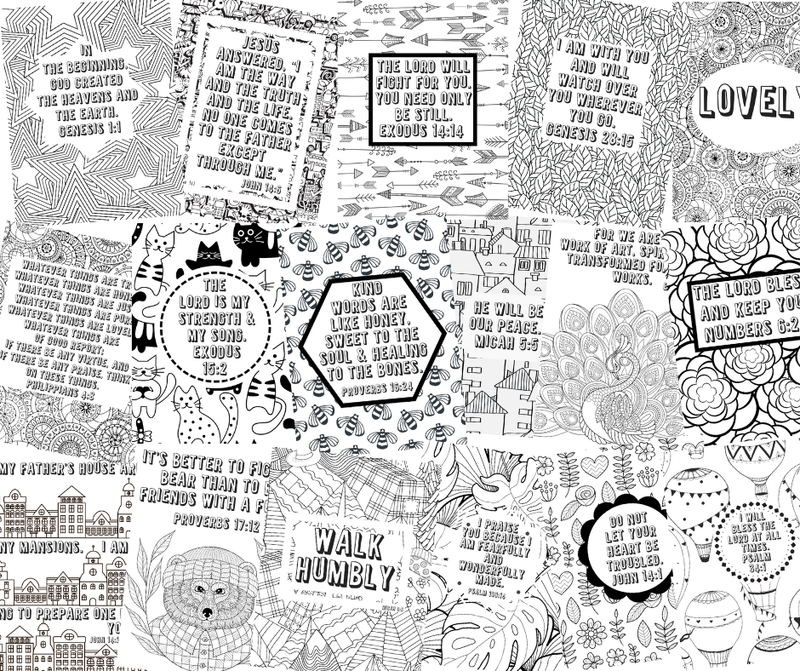 Suffice it to say – we were tired. 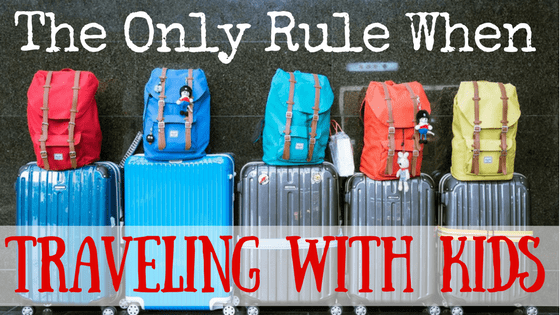 This post, The Only Rule When Traveling With Kids, contains affiliate links for your convenience. 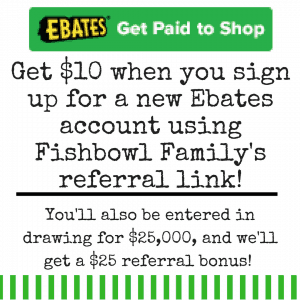 This means that if you click on a link and make a purchase, I’ll receive a small compensation. To read our full disclosure policy, click here. To prepare for the drive, I spent hours on Pinterest during the middle of the night feedings coming up with fantastic ideas for entertaining our then five and three-year-old (we left the newborn with grandma). I assembled baggies of activities. 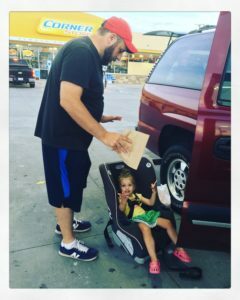 I even had my husband make cookie sheets into trays that connected to their car seats with velcro. I just knew this would be a fantastic travel experience! Somewhere in Louisiana we stopped and bought a DVD player for the car. The pipe cleaners spilled and the beads scattered and the Playdoh got carpet fuzz in it and the stickers were put on the car windows and on and on. Oh, and our three-year-old son started running a fever. 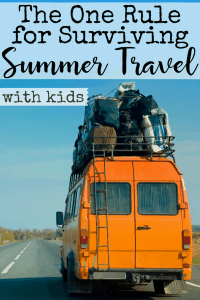 That trip completely changed my mentality about travel with kids. If that means letting your kids watch the same Daniel Tiger episode on repeat for three hours straight, do it. If that means giving all of your kids Dramamine but still keeping several Rubbermaid containers within arms reach, do it. If that means packing special snacks and tossing them to the back of the Suburban to push on for one more hour before stopping, do it. All moms love the idea of having kids that sit and play with pipe cleaners for hours, eat organic gluten-free Sun Butter and jelly sandwiches without smearing it all over everything, and speak kindly to each other when asking for another kale chip. And if this describes your family that is so awesome. Stop reading now because you have everything figured out, and there is absolutely nothing I can help you with. Because I don’t have it all figured out, and every single road trip makes me regret even leaving the house. My oldest daughter HATES to sleep and will fight it until she is delirious. This rules out traveling at night while the kids sleep because she is nocturnal. Our youngest son is one and is a total X factor. There have been trips that he’s entertained himself with a single Little People policeman for hours and trips that he’s been discontent with every toy we packed. This is what the Anthony family is working with, so we do whatever it takes to simply make it to the destination. In our case, we have three DVD players with headphones and a ton of DVDs. We give all the kids Dramamine because throw up is disgusting and inevitable without it. We drive as fast and far as we can until the kids are losing their collective mind. Then, we stop at a Chick-fil-A so they can play, and we can eat some delicious chicken. Then we get back in the car and start over. This is what works for us in this season of life. So, figure out what works for your family. We cleaned vomit out of car seats at least a dozen times before we figured out that these Rubbermaid containers worked best for catching and containing it. And despite all the difficulties of traveling with kids, I still think traveling with kids is worth it. It’s worth it to travel to see family or go on an adventure together. Vacations are a necessary part of life, so we push through the travel time to get to the location. Worst case scenario: you have a ton of really great family stories. 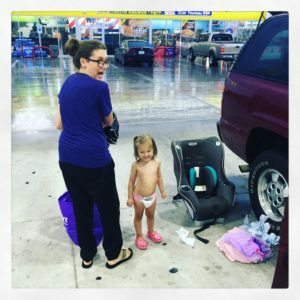 Every time we drive past a particular gas station in Temple, Texas, our oldest daughter points it out to remind us of the time her little sister threw up 45 minutes from home and 6 hours from the beach. And then 45 minutes from the beach house and six hours from home. I’m sure as they get older, some of it will change. Because the point of traveling with kids is to get us all to the destination safely. The journey isn’t something we can enjoy much right now, and honestly, I’m okay with that. I’ve never been much for road trips. Maybe someday we will want to just drive across the U.S. or at least purposely go slowly to enjoy the sights. But if that day comes, we will need to drive something better than a fourteen-year-old Suburban that smells of Cheerio dust and gym socks. What are your tips for traveling with kids? Great tips, Halee! My two are both teenagers now, but I’ve travelled halfway across the country (and also to Alaska) with them multiple times by myself when they were young. We don’t really watch tv at home, but on trips DVD players are a lifesaver! 1) When travelling by plane, carry on a change of clothes for yourself, not just the kids. If one of them throws up on you, you are going to need an extra shirt, too! 2) Don’t force mom or dad to be everyone’s packmule. Kids who are at least 5 or 6ish can handle their own carry on for the car or plane. Buy them a nice wheeled backpack that they can use for several years and let them pull it. Allowing them to have some say in what goes in it also gives them a sense of ownership. 3) Buy at least one inexpensive surprise toy or book for the trip (or each way) for each kid. Novelty goes a LONG way! Sticker books are great for kids who enjoy matching things up. I don’t have kids, but this gave me a good laugh. Mostly just remembering how it was when I was a kid. We played the “quiet game” a lot. …I always lost. ? We did that when I was a kid too! Now there’s so much technology! I find myself saying, “When I was a kid, we didn’t have movies in the car!” Which only makes me sound super old and doesn’t make my kids any more appreciative. ? You are so right! 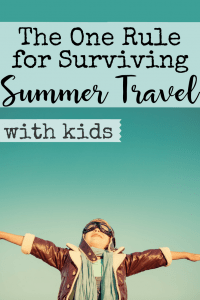 When I was preparing to fly to Africa with a two-year-old, I asked a seasoned mom of 5 how to survive the long flights. I’ll have to add “Do what works” to my list of essential travel advice! Yes! Do what works! So many people put off traveling with their kids until they are “older”, but the kids never seem to get “older”. I find myself thinking that way sometimes, but I don’t want to wait to enjoy experiences with them! We are at the beach this week and I’ve definitely said, “this will be so much easier in a few years!” Mine are currently 1, 3, 6, and 8. But it’s so sweet watching our one year old enjoy the ocean! It makes the difficulties all worth it! I’m glad I’m not the only mom who is all over the place with travel. We have the best and worst memories from trips! I thought you had a very important phrase there “in this season of life” because yes different things will work at different times and now for us we are in the grandparents of a 2 year old and a 5 month old so we are experiencing this all over again. Thanks Sandra! Anytime I feel overwhelmed (everyday), I remind myself that this is just a season of life and they will be teenagers with all new problems soon enough! 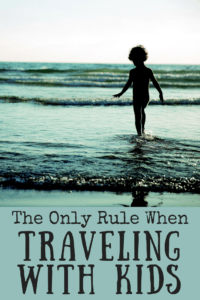 Awesome post and i agree traveling with kids is hard and something I definitely dread a bit! We have 3 under 5 so a lot of what you have said would be very helpful. Do what works, I love it! I will use some of these tips for flights as well. Thanks Liz! I frequently remind myself that this is just a season of life. It will get easier in some ways and harder in some ways. Good luck with traveling with your kids! Three under five is tough, but I’m sure they’ll be great friends when they get older!